PXI Chassis, 8-Slot 3U - GX7800 | Marvin Test Solutions, Inc. 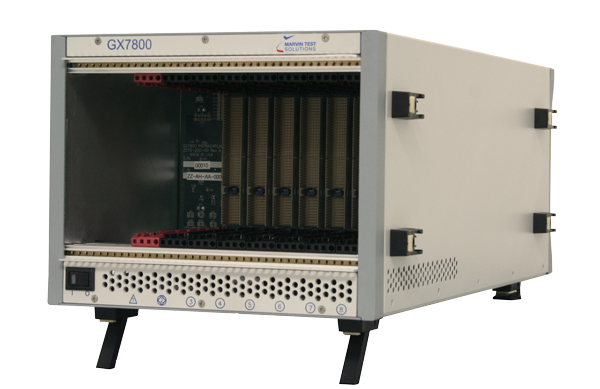 The GX7800 is a compact, 8-slot PXI chassis that can accommodate up to 7 instruments as well as an embedded 3-slot PXI controller or an external bus controller such as a MXI interface. The GX7800’s compact 3U form-factor occupies only 9 x 18 inches of bench space, making it ideal for benchtop or space constrained applications. System power for the GX7800 Series is provided by a single power supply configuration that provides 450 watts of system power. Forced-air cooling for the chassis is provided by two 79 CFM fans located under the card cage with a separate fan providing cooling for the system power supply. Two fan speeds provide the user with flexibility to optimize thermal management within the chassis for both low and high power configurations. The chassis’ cooling configuration provides airflow for all module slots per the PXI specification and requires no additional rack space for inlet or outlet air. The eight-slot layout of the GX7800 consists of six PXI-1 slots, one PXI timing slot, and one PXI controller slot which can accept a 3-slot controller. An external 10 MHz PXI clock can be also be supplied to the backplane via a connection on the rear panel of the chassis. Access to the on-board PXI 10 MHz clock is also available on the rear panel of the chassis. The chassis is supplied with the HW software package which provides a PXI Explorer application that is used to view and configure the PXI system configuration files used by resource manager software. Cooling Two 79 CFM fans for system cooling. Dedicated 50 CFM fan for power supply cooling. 10 MHz Clock Output 10 MHz output is available via a rear panel BNC connector, TTL compatible level. Note: Specifications are subject to change without notice. This Setup / Package file contains all necessary files (including user’s guide, help, etc). Expand to view and download individual files included in the setup. To order call 1-888-837-8297 or order on-line via the form below. Prices are specified for USA destination orders. Prices are noted in USD. Import duties, taxes, and charges are not included in the item price. Marvin Test Solutions, a vertically-integrated aerospace test and measurement company, has created and delivered innovative, reliable test systems for factory, depot, intermediate, and flightline use since 1988. Our expertise delivering aerospace precision underpins our manufacturing solutions, enabling us to quickly meet customers’ requirements with high-performance products and custom turnkey systems, backed by excellent long-term customer support. © 2019 Marvin Test Solutions, Inc.